This is a lovely lot of Peter Rabbit items. The wall plaques are by FW & Co. 2002, are made from polystone and lovingly painted by hand. They have a 3D look about them. 2. Peter by the pond - original string hanger, and original paper tag. They would be wonderful on the wall for a nursery/baby room, toddlers room or even the play room. "HAPPINESS IS HAVING SOMEONE TO CARE FOR"
This is a lovely Holly Hobby wall plaque. It has a pictures of a girl with her cat in the kitchen with dishes. It is over 30 years old and has no chips or cracks to it. This cute little ceramic sleeping cat was made circa 1950/1960 by the Hungarian artist Joseph Szeiler. It has ''Szeiler Made in England'' on its bottom. 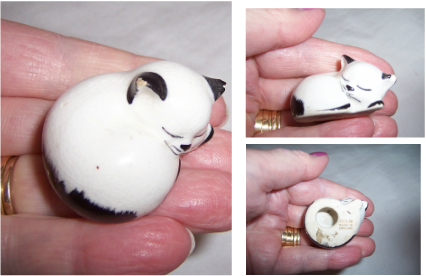 Szeiler made many different ceramic animals, and this cute curled up small black and white sleeping cat is just lovely. It is approximately 5cm long and 3.50cm wide. It is in good condition however one of the ears it tipped, and some minor crazing to the porcelain as you expect from something which is over 50 years old.. The stickers are in its original packaging and are unused. We have taken them out of the packaging just for the photos. There are 25+ self stick, pre cut reusable wall sticker decorations. The pictures of the bears are very cute. They could be used for many things such as craft work and put onto cots, cradles etc for dolls or teddy bears.